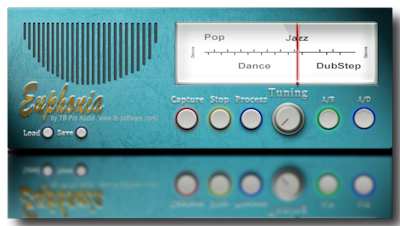 tb-software.com has updated Euphonia, the optimal audio spectrum balancing plugin for the mastering stage, to v1.2, adding RTAS support for Windows. Euphonia compares the spectral fingerprint against built-in curves (Pop/Rock/Dance/Jazz/DubStep) and calculates filter settings so that the spectrum of the audio follows the selected average spectrum curves. 32/64-bit DAW under Microsoft Windows XP SP3, Vista and Windows 7/8.